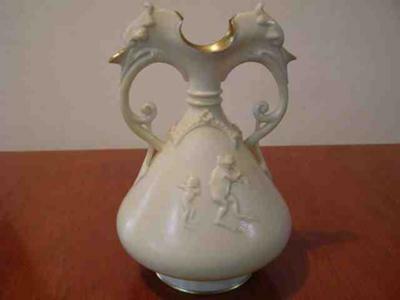 I have an interesting Doulton Burslem china vase with Frogs Mice & Birds, I would like to share. 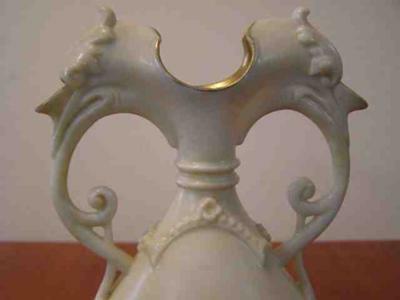 The vase is stamped on the base Doulton Burslem with the coronet on top and England underneath which I have been able to find out dates it between 1891 -1902. The number 356 is also inscribed on the base. There are no other marks. Size is 17cm in height and condition is very good with no damage. 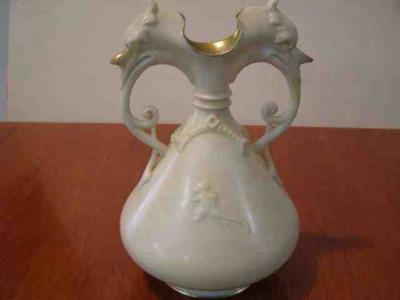 I have been searching the web trying to find a similar example of Doulton Burslem wares in order to find out a value but have been unsuccessful. The first photo shows one side of the Doulton Burslem vase that has 2 frogs playing flutes. Photo 2 shows a mouse running. Photo 3 shows the top that is in the form of 2 eagles or phoenix heads. Water can be poured through the hollowed birds beaks. I was wondering if something like this with the frogs and mouse could have been influenced by George Tinworth? I would love to know more about it as it certainly appears to be a fun piece, certainly away from the mould of the traditional Doulton Burslem pieces I’ve seen. I would appreciate any thoughts or comments.